The 2016 Iowa State University Biennale entry was completed by fifty five architecture and interior design students at Iowa State University and five architecture students at Rome Tre University in Rome, Italy, is a collaborative response to the call set forth by Alejandro Aravena for La Biennale di Venezia 2016. This project was under supervision by instructors Shelby Doyle, Leslie Forehand, and Graduate Assistant Andrew Meyer. A booklet has been put together by the students describing the project’s formation. Click to view. Disrupt/Displace is a critique, performance, and proposal that responds to 2016 Venice Biennale theme reporting from the front. The theme for The 2016 Venice Biennale focused on investigating the role of architects in the battle to improve the living conditions for people all over the world. The students came up with a four part response. In response to Aravena’s statement students Identified the Bakken Oil Pipeline as a spatial condition that had social cultural and political ramifications. The students hoped to not portray just one side of the issue at hand, but rather the complexity of the situation. Through the investigation students looked at eminent domain abuse, impacts of energy infrastructure, environmental dependence, and economics. Students created a performance which symbolically reenacted the situation. For the performance an abstracted version of the Jeffersonian grid, which dominates the Iowa landscape, was constructed on the floor. The grid was composed of twisted forms that were inspired by the elevation view of a typical corn stalk. After designing and creating the instillation students had to transport the piece to Venice. The individual modules were designed in such a way that they could be flattened for easy transportation. 28 students transported 900 units to the Venice through carry-on suitcases. 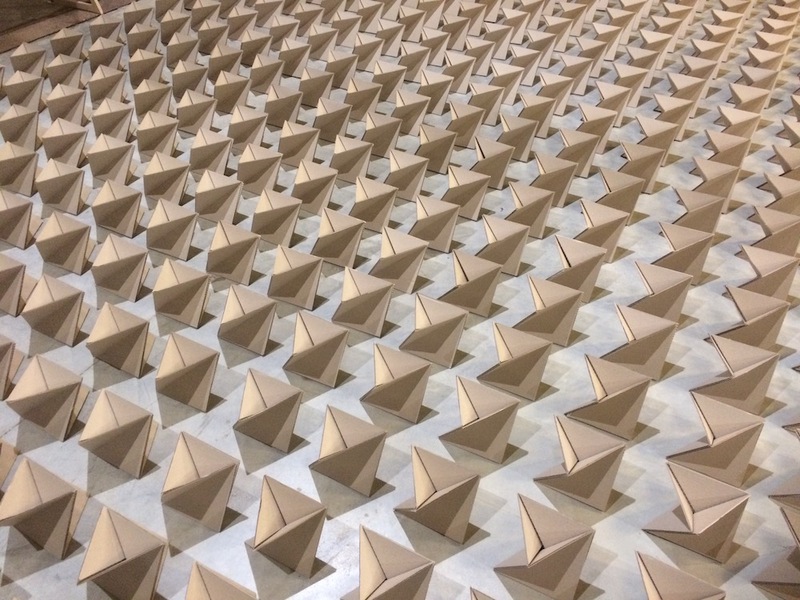 Upon arrival the modules were unpacked and assembled into the 3 dimensional form. The performance in Venice was divided in three parts. First the construction of the grid, enacting the restraining of the open prairie to the Jeffersonian grid. Once the grid was in place students created a diagonal pathway which cut through the grid exemplifying the extreme nature of the disruption. Finally onlookers were invited to participate by walking though the path created from the destruction of the grid, and the report was presented. Disrupt/Displace is a response to Venice Biennale curator, Alejandro Aravena’s request to ‘Report from the Front’: it is simultaneously a critique, performance, and proposal in four parts: PART 1 Searching for the Front (Ames, Iowa) PART 2 Constructing the Front (Ames, Iowa) PART 3 Reporting the Front (Venice, Italy) PART 4 Colloquium and Conclusions (Venice, Italy) To read Alejandro Aravena’s full curatorial statement: Reporting from the Front. A publication was produced by the students of the class. In the final pages a brief conclusion is added summarizing many of the questions and thoughts that were left after the Biennale. “We as students engaged in a discourse about architecture as a tool to improve people’s quality of life. Life ranges from very basic physical needs to the most intangible dimensions of the human condition, and consequently, improving the quality of the built environment is an endeavor that has to tackle many fronts. In Disrupt/Displace we studied an issue that is unquestionably spatial, political, and social. However, we don’t believe architecture can do anything about the Bakken pipeline or the complexities surrounding it. We are unsatisfied. Reporting is not enough. In the case of the Bakken pipeline, the pursuit of money has left thousands of people without agency in their lives. We found that this parallels the issues we see in the architectural profession. segregation, inequalities, peripheries, access to sanitation, natural disasters, housing, shortage, migration, informality, crime, traffic, waste, pollution, and participation of communities. In Rome, Pia Schneider and the administrative staff at the ISU CoD Rome facility; ISU Rome program faculty: Karen Bermann & Simone Capra (Architecture), Jody Patterson & Simone Bove (Interior Design). In Ames, the staff of the College of Design and Department of Architecture, particularly Jen Hogan, Director of International Programs.